H-Stands are Perfect for use with Omni Metalcraft Roller or Skate Wheel Conveyors. Omni Metalcraft Adjustable Conveyor Legs are made with heavy duty channel construction that offers permanent Conveyor support. Height adjustable table legs and pivot plate mounts for greater flexibility. Conveyor Stands allow for floor anchoring for stability. Hytrol® Conveyor Stationary Floor Supports Support Conveyor above the Floor. Hytrol® Stationary Floor Supports are made of powder coated steel for long lasting durability. 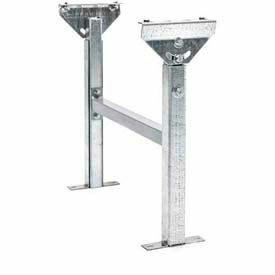 H- supports have adjustable heights ranging from 12-1/3 - 15-1/3 to 33-5/8 - 45-5/8 inches. Conveyor legs are made of durable steel for added rigidity. Available types are For Hytrol® Ball Transfer & Roller Conveyors or For Hytrol® Skate Wheel Conveyors. Ashland Conveyor Support Stands are used for a variety of Conveyer Applications. Square Tubes are made of welded and bolted steel with powder coating for long lasting durability. Tripod supports used for quick temporary light duty applications and easily adjustable and very portable. 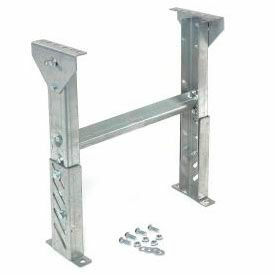 H-stands used for permanent, as opposed to portable conveyor installations. Castered supports make conveyor sections portable on smooth floor surfaces. Supports ship unassembled. 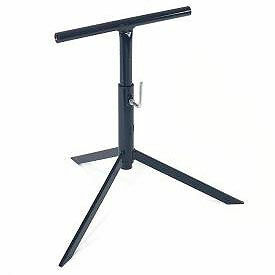 Styles are H-Stand, H-Stand Castered with Knee Braces and Tripod. Adjustable heights vary per type. Omni Metalcraft Tripod Stands are Sturdy, Dependable Conveyor Support! Omni Metalcraft Adjustable Tripod Stands are used for installing gravity or support lines and for areas where portability is necessary. 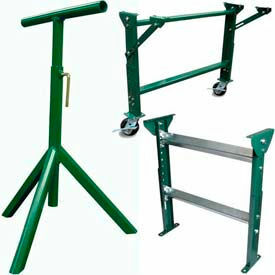 Tripods can be used on Skate Wheel conveyors or 1-3/8" diameter Roller conveyors. Adjusts easily. 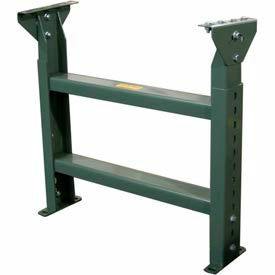 UNEX® Adjustable Gravity Conveyor Support Stands are used for Warehouse or Product Loading and Shipping Applications. UNEX® Adjustable Gravity Conveyor Support Stands are made of solid corrosion resistant galvanized steel for long lasting durability and dependability. Various H-Brace, Single Leg or Tripod type support units are designed for use with either Roller or SkatewheeI gravity conveyor systems. Adjust to various heights and are available for 18 or 24 inch width Straight or Curved conveyor units. Omni Metalcraft Portable Castered Conveyor Supports are specifically designed for Quick and Easy Mobility. Omni Metalcraft Portable Castered Conveyor Supports have a steel construction for long lasting durability. Design allows for easy mobility of 10' long 1-3/8" Roller Conveyors or 10' long Skate Wheel Conveyors. 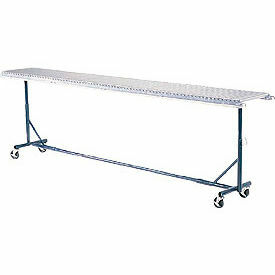 Conveyor Stands easily adjusts in height from 24" to 40". Choose from widths ranging from 12" to 24".